Psoriasis is a medical condition that occurs when skin cells grow too quickly and the immune system cause new skin cells to form in days rather than weeks. The body does not shed these excess skin cells, so the cells pile up on the surface of the skin and lesions form. There is no cure, but treatment with various creams or ointments can often clear, or reduce, patches of psoriasis. Powerful medication or special light therapies are treatment options for severe cases. In the United States, nearly 7.5 million people have psoriasis and about 150,000 new cases are diagnosed each year. It has a tendency to run in families. Psoriasis can begin at any age, from infancy through the golden years. Most people first see psoriasis between 15 and 30 years of age. About 75% develop psoriasis before they turn 40. Another common time for psoriasis to begin is between 50 and 60 years of age. People with psoriasis have a faster turnover of skin cells. It is not clear why this occurs. Stress can aggravate psoriasis. However, some people feel that stress does contribute on some occasions. Plaque psoriasis : It is the most common form of psoriasis and is made up of patches on the skin called plaques. Each plaque is red and with rough flaky white scales. The most common areas affected are the front of the elbows and knees, the scalp, and the lower back. However, plaques may appear anywhere on the skin, but they are uncommon on the face. Nail psoriasis : This type of psoriasis is found among half the people suffering with plaque psoriasis. Without the skin rash also it may occur and may have pinhead sized pits in the nails. In some cases, the nail may separates from the nail bed. There is no effective treatment for the nail problems of psoriasis. 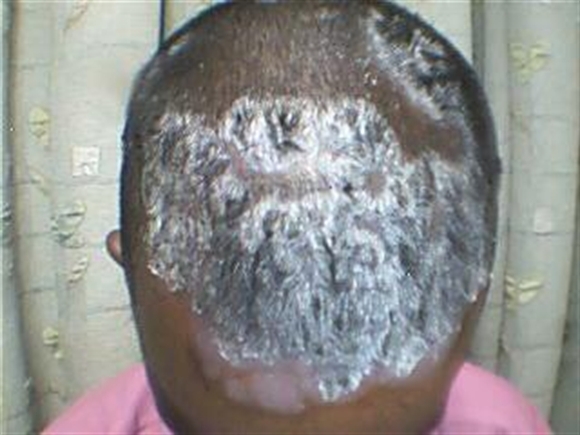 Scalp psoriasis : This can occur alone, or in combination with psoriasis in other parts of the body. It may resemble like severe dandruff. Guttate ('drop') psoriasis : This type of psoriasis occurs following a sore throat caused by a bacterium. The plaques of psoriasis will be small (less than 1 cm) but occur over many areas of the body. It normally lasts a few weeks, and then fades away. It may never return. But, if you have an episode of guttate psoriasis, you have a higher than usual chance of developing common plaque psoriasis at a later stage. 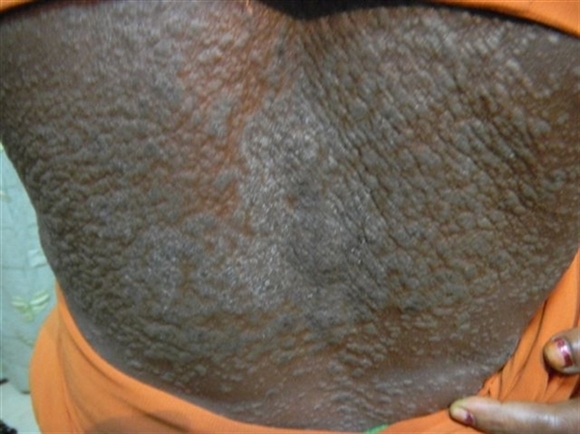 Other kind of psoriasis : Such as pustular psoriasis or 'erythroderma' are uncommon. Psoriasis can be itchy, but does not usually cause much discomfort. About 1 in 10 people with psoriasis also develop inflammation and pains in some joints (arthritis). This is called psoriatic arthropathy, cause is unknown. The main problem is the unsightly appearance of the rash. Some people become quite anxious or depressed due to their psoriasis. Psoriasis is a common skin condition in which red patches covered with silvery scales will develop. Once patch develops it tends to “come and go” throughout life. It has a tendency to run in families. It can first develop at any age, but most commonly starts between the ages of 15 and 25. The exact cause is not known. In Psoriasis the cell turnover is rapid when compared to normal skin hence thick patches are formed. Which parts of the body are affected by Psoriasis? In addition to the skin, nails, scalp, mucous membranes, bones are also affected by Psoriasis. No! Psoriasis is not contagious. You will not get it by touching a Psoriasis patient. Plaque Psoriasis: Small or large red patches on Elbows, knees, back etc. Guttate Psoriasis: Rain drop like patches all over the body. 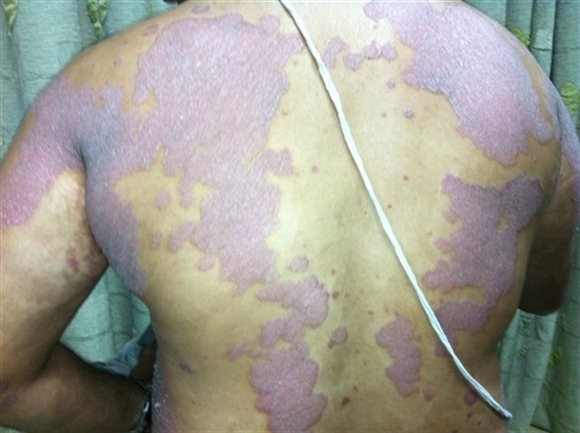 Erythrodermic Psoriasis: Whole skin becomes red and scaly. Psoriatic arthritis: Involves bony joints. Treatment is highly individualized. It depends on the type of Psoriasis, extent of involvement, Age of the patient and associated condition. In the present times, there is no cure for psoriasis. Hence, the main objective of treatment is to reduce inflammation and slow down the rapid growth and shedding of skin cells. Ointments and creams (to moisturize the skin) will be prescribed like Steroids (such as cortisone creams),Vitamin D cream, creams containing salicylic acid or coal tar ,anthralin,,methotrexate and oral or topical retinoids. The information provided here is for a reference and in no way the information given is a substitute’s advice(s) given to you by your doctor. For advice call Dermacare.